I could tell from the drivetrain that it didn't have many miles on it (as advertised) but it was also obviously transported on one of those racks that holds bikes by the top tube as it has several "burn" marks and scrapes that are the usual signs of two bikes rubbing together on a rack. I guess it has character. I changed the crank, tires, seatpost, saddle, pedals, and handlebars. I added the fenders. I've never had a bike with disc brakes so adjusting the brakes has been a bit of trial and error combined with internet research. The Roger was billed as a single-speed cross bike which is a bit strange since you can't use disc brakes in cross races (at least UCI cross races). However, I tried cross racing once and didn't like it so I have no desire to try racing this in any local races. The setup matches my other road bikes for fit. Don't know how it rides as I've got a nagging respiratory ailment that I don't want to drive further into my lungs. I'm even looking forward to training on it in dry weather. if that's your rain bike, then you should get some proper fenders, or at the very least a set of cruds. That's right, blame it on the wife. -I've been looking for a 55 for over a year. I'd have gotten "better" (and cheaper?) fenders if the front fork had a center bolt hole. I saw the Pez review on the Crud Roadracer fenders but they attach to the brake center bolt. These fenders should be good enough for SoCal (I hope). Actually, my wife told me a few years ago that if I wanted a new bike I had to sell an old bike. As for finding the Roger, I'd been keeping my eye on craigslist and ebay periodically and they are definitely few and far between. I definitely lucked into finding this one. Use p-clips or something but really put full fenders on there! Yeah really, put some proper mudguards on, with a nice flap added to the back one to keep the spray out of everyones eyes. Why disk brakes? Are they not way too strong? I'm leery enough using calipers hard if it's wet. that's an eyesore disguised as bling eye candy. I saw the Pez review on the Crud Roadracer fenders but they attach to the brake center bolt. Yeah, that's too bad. Hmm. Hey Wanders - just sent you a pm. I am close by and may be selling my 55cm Roger soon. Nice. I've wanted one of those for a while too. With zip ties, you can do wonders with full fenders for bikes without fender mounts, though p-clips and some fender drilling may be necessary. 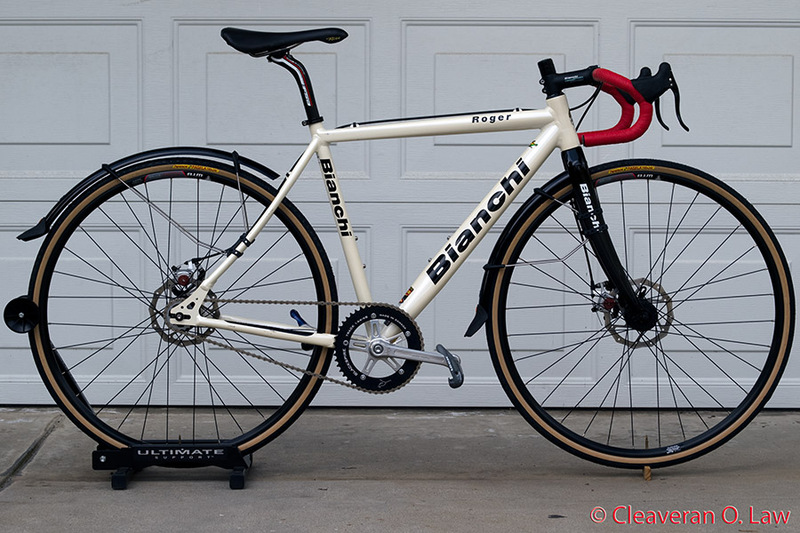 i wouldn't worry about the full fenders seeing as cleave's in so cal, you can probably put the rain in quotes. Imagine how many responses I'd have gotten if I had asked for fender advice. Seriously though, thanks gentlemen for all of the fender information. After looking at the referenced sites and a few others I now know more about fenders than I will probably ever need for the rest of my cycling career. The bike doesn't have an issue with mounting for the fender struts -- the bike has threaded eyelets at the dropouts. The bike also has a drilled "brake" bridge across the seat stays so I could mount a proper rear fender. The problem is the fork. The fork isn't drilled for a front brake so there is nothing for attaching the fender. After looking up P-clamps I now know what they are and I have used them in the past to mount racks to a racing mountain bike. P-clamps aren't the solution for my fork dilemma. Oh, and I'm not going to try my hand at drilling a carbon fork. Basil, the fenders that I have on the bike do have rubber mudflaps though the position of the rear fender makes the flap kind of meaningless. Also, this is my first bike with disc brakes. I'm hoping that they will actually be more predictable than standard rim brakes in the rain. Oh, and Rich, thanks for NOT posting food pictures, I'm trying to lose weight (or at least not gain any more weight ). Will, it's a "rain" bike. I'm looking forward to riding it this coming Saturday on my club's B ride. No riding if the roads were soaked. No riding if the roads were damp and it was drizzling. Consider not riding if there was a good chance of rain during the ride. Rules 1 and 2 are no longer valid. No riding if there is a good chance of a monsoon during the ride. Basically, I'll stay indoors if it's raining hard. Otherwise, bring it on. Can you shove a star nut up into the bottom of the fork and use that to hang the fender from? or go to ADT. i guess that counts as staying indoors. Zip ties with rubber underneath them for the fork mounts? Yeah, a zip-tie web over the fork crown to make a fake brake bolt/hanger would be more than enough to hold the Mr. Cruds in place. You can use a Honjo fender bracket. It sits between the brake caliper and fork, bolts directly to the fender. Nah, don't bother with them- cut a really long one from an old fairy liquid bottle or something. One of them on the back of a proper mudguard will keep the rider behind you very happy. I've always liked that my rim brakes get a bit weaker in the rain- not keen on washing out the front wheel. Let me know ow you get on with those, I'd be interested to know.